AMD is attempting to simplify buying computers for the average punter by doing away with the plethora of stickers that are normally attached to computers in shops to replace them with its Vision brand. 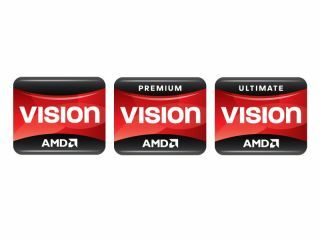 AMD's research showed that people found the traditional stickers confusing, and decided that it could boil its tech into three fairly broad categories; Vision, Vision Premium and Vision Ultimate – which will arrive in public with Microsoft's Windows 7. The scheme is being supported by most of the major players in computing – including Acer, Asus, Dell, HP, MSI, Toshiba and DSGi. The basic Vision brand is for entry level laptops, promising to support DVD movie viewing, 'casual gaming' and rich internet browsing, Premium steps up to Blu-ray and HD (if the hardware support is there obviously) and Ultimate includes editing movies and 3D gaming. As you may expect there are some slightly odd anomalies caused by the simplification, and AMD insists that the tech is still very important to them and this is merely a form of simplification rather that a replacement for the hard facts of a specs sheet. But the decision actually seems very sensible, promoting an easier experience for those millions who merely want their laptop to cope with their normal daily usage. Urging OEMs to 'stop talking about processors and start talking about usage' Vice President of World Wide Product Marketing Leslie Sobon explained that this step was necessary. "There is currently difficult of choice for the consumer," said Sobon at the launch of the concept. "Most people don't care what processor is in their iPhone or Xbox or television, and they don't care what processor is in their computer." Sobon also confirmed that AMD has a three year commitment to the project. "Technology matters hugely to us," she added. "But this is about communication."